Ask successful writers and they ll tell you, the key to writing well is revision. Ask elementary school teachers and they ll tell you, the real challenge of writing instruction is teaching kids how to revise. Ruth Culham is both a successful writer and a writing teacher, and she s discovered how to teach writing and revision in a way that s accessible to both teacher and students: First read the writing, assess it using the traits of writing, then teach the writers and guide revision decisions using traits as a common language and map. This book shows you how to assess and teach writing in a way that s practical and doable and best of all, see results. Part 1 walks you through the traits of writing and their key qualities, showing step by step how to read students writing and offer feedback that nudges them forward through the revision process. Chapters will help you address challenges students face within each mode of writing (narrative, expository, persuasive), and provide tools young writers can use to evaluate their own writing and make revision decisions accordingly. 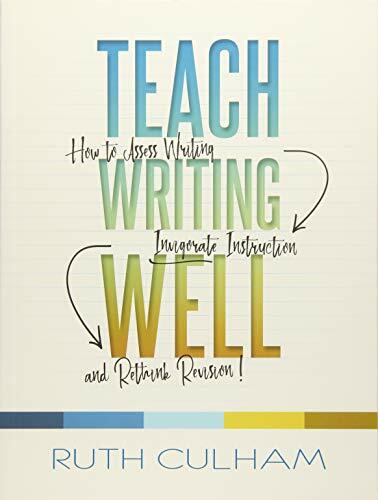 Part 2 dives into instruction, offering specific guidance for how to use what you ve learned from reading student writing to design lessons that scaffold students toward making their own craft decisions and revisions. In addition, there s an entire chapter devoted to mentor texts that you can use to model traits and key qualities for your students. If you have any questions about this product by Stenhouse Publishers, contact us by completing and submitting the form below. If you are looking for a specif part number, please include it with your message.